Here we have 2 computers testing the capacity of Kling-Net. Kling-Net can make use of gigabit ethernet and in this test we reach close to 50 MB/sec. To do that we have one computer acting as a media server. For testing facility the software just grab the computer screen and then send it to the Kling-Net devices mapped. The other computer is acting as 30 virtual LED panels, each panel has 128 by 128 pixels and receive pixels in 24 bits of resolution, 8 bits of each component red, green blue. Here you see the screenshot of the MacBook acting as the server. 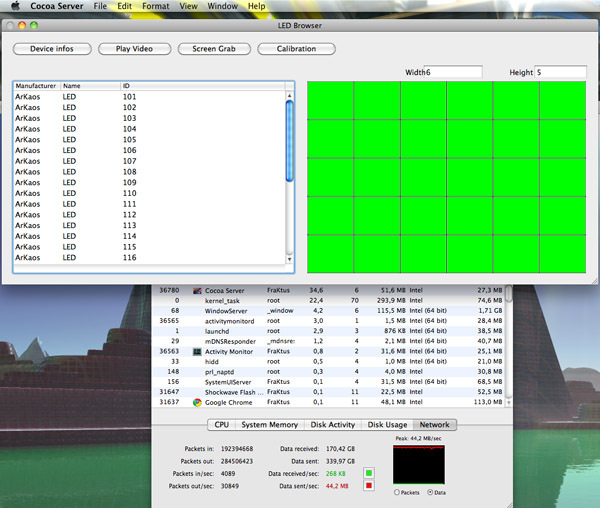 The server application is called “Cocoa Server” you can see it just uses a few Mb of memory and 34% of cpu time. It feed the 30 LED tiles of 128 by 128 pixels at 30 FPS. The bandwidth is very stable at around 44.2 MB/sec. The Kling-Net protocol has no restriction regarding output FPS or bandwidth other than the hardware limitation and so it has the capacity to saturate even gigabit ethernet. Video made with an Android phone, the focus is not good when you are too close of the subject. Here is another test where we drive a lot of devices. 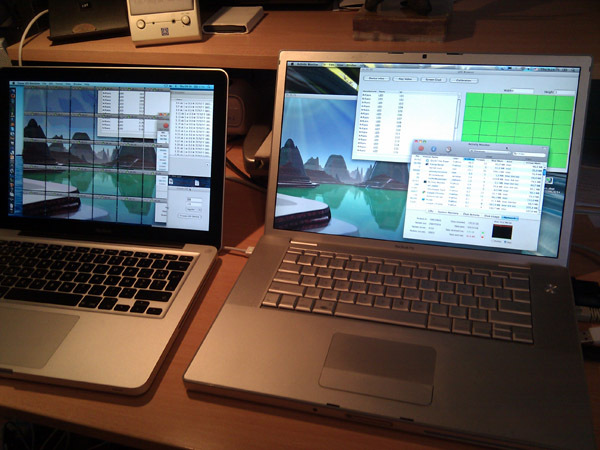 In this case there are 1500 Kling-Net devices, the set-up is the same than in the first test: one laptop is the server and the other one is simulating 1500 devices. So in this test the server is opening and holding 1500 TCP streaming sockets. Faster server will hold much more connections. The devices are low resolution 8 by 8 pixels but we still need around 30 MB/sec on the gigabit link. The high number of packets per seconds (~44.500) is due to the fact that we feed 1500 devices 30 times per seconds in this test.